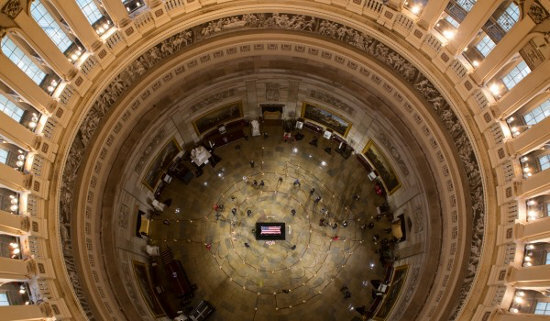 It seemed almost unbelievably good news when I heard yesterday that the body of renowned American evangelist Billy Graham will lie in honor at the Rotunda in the US Capitol tomorrow February 28. Only 33 Americans have been honored this way in our nation’s history, and Billy Graham will be only the fourth private citizen, along with some former Presidents and other government officials. In the eyes of some, this may just seem like a nation honoring a good and worthy man. But I believe it is far more than that. Just as Billy Graham honored God with his life, America is actually honoring the God that Graham served for a lifetime, proclaiming the Gospel of Jesus Christ. At least for tomorrow, America is letting her light shine out. This is a national declaration proclaiming, "For I am not ashamed of the gospel of Christ, for it is the power of God to salvation for everyone who believes, for the Jew first and also for the Greek." (Romans 1:16) We pray that the nations of the world take notice. A Welsh friend of ours had a rare opportunity to pray out loud in a small private gathering in the Rotunda in late 2016. He told me that part of his prayer was this verse from Habakkuk 3:2, "LORD, I have heard of your fame; I stand in awe of your deeds, LORD. Repeat them in our day, in our time make them known; in wrath remember mercy." I think this event is part of the Lord's answer to that prayer, and countless others as well. Oh, that the world would take note of His fame! Jesus said in Mathew 5:14-15, "You are the light of the world. A city that is set on a hill cannot be hidden. Nor do they light a lamp and put it under a basket, but on a lampstand, and it gives light to all who are in the house." There may be fleeting opportunities to do this as a nation, but as followers of Jesus we are called and empowered to do this throughout our lifetime. Gladys and I have had plenty of company lately, so some of our prayer times have been wonderful. 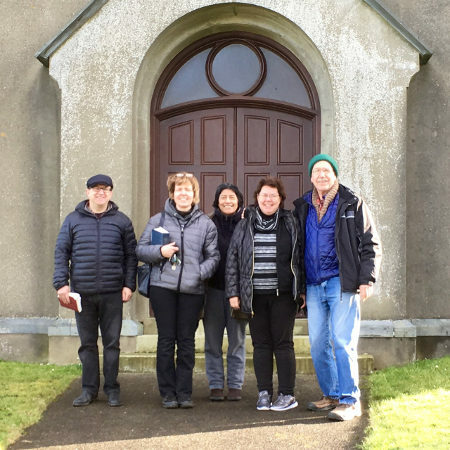 Our friend Rita from South Africa came to stay with us ten recently, and during her time with us the Lord spontaneously orchestrated this little group representing five nations: Emyr from Wales, our neighbor Sue from England, Gladys from Guatemala, Rita from South Africa and myself from the USA. As we continue to pray and cry out to God for revival here, we are very much aware that His company of intercessors is growing. Just yesterday morning, for example, we had the opportunity to pray with a small group in Swansea that some old friends have recently started. He is calling people into a more earnest place of prayer, not just in Wales and the rest of the UK, but throughout many lands around the world. 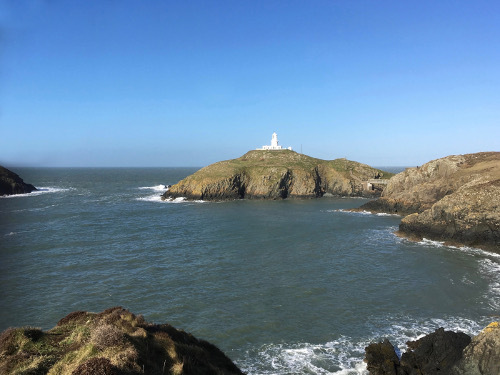 We are constantly hearing from people who are being drawn to here to pray and then return to their own countries with a "deposit" of Welsh coals of revival. And others are drawn to move here and are being woven into the fabric of prayer that God is developing across the land. And this is just one small country. We know that God is at work as we see the pace and intensity of prayer pick up around the world, and these are just the ones that we hear about. We are living in challenging and exciting times, and we keep looking to Jesus, the author and the finisher of our faith. We want to bless you and thank you as you continue to add your prayers to this great international concert of prayer for revival and for the lost. Last week Gladys showed me this video that a friend had posted last year. It is just a wonderfully vivid representation of what revival is about—lives changed by divine intervention. 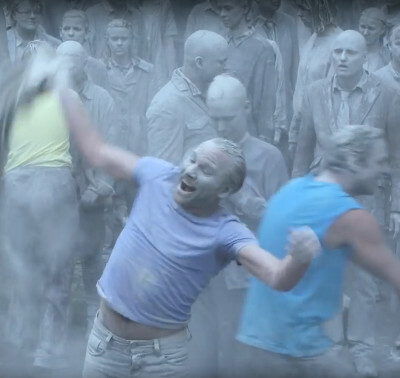 Interestingly it is a secular production by a German group, about which I know little more than that they are clearly not presenting the Gospel, but it is quite powerful and brought me to tears more than once. I host of scriptures came to mind, including Colossians 2:13, "And you, being dead in your trespasses and the uncircumcision of your flesh, He has made alive together with Him, having forgiven you all trespasses," and Romans 6:13, "And do not present your members as instruments of unrighteousness to sin, but present yourselves to God as being alive from the dead, and your members as instruments of righteousness to God." Perhaps one of my favorites is the verse in Job 14:14-15 that says, "If a man dies, will he live again? All the days of my struggle I will wait until my change comes. You will call, and I will answer You; You will long for the work of Your hands." As we pray for the salvation of loved ones and friends, it strengthens and encourages us to know that the Lord desires their salvation more than we do! 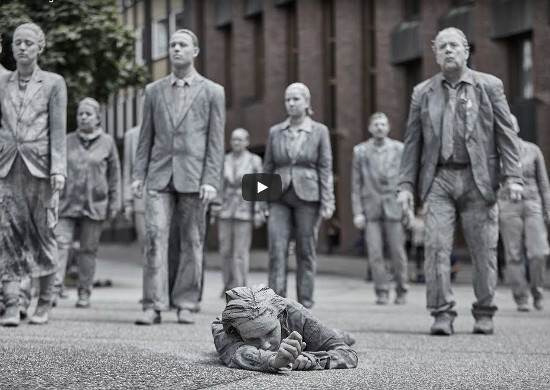 This brilliant theatrical flash mob is good fuel for prayers for revival, well worth taking seven minutes to watch! To watch it just follow this link. Keep in mind this is not a Christian production, and is far from perfect or complete, but what it depicts is unmistakable, and the exuberance towards the end is great. But it doesn't hold a candle to what we know as believers in Jesus. 1 Peter 1:6-9, "In this you greatly rejoice, though now for a little while, if need be, you have been grieved by various trials, that the genuineness of your faith, being much more precious than gold that perishes, though it is tested by fire, may be found to praise, honor, and glory at the revelation of Jesus Christ, whom having not seen[a] you love. Though now you do not see Him, yet believing, you rejoice with joy inexpressible and full of glory, receiving the end of your faith—the salvation of your souls." 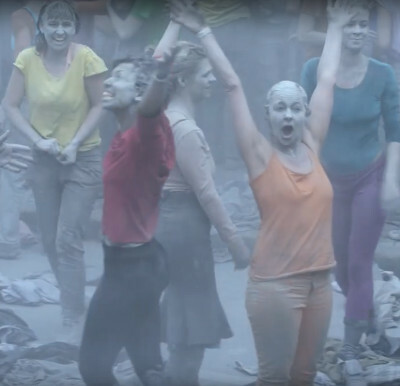 We hope this blesses you and provokes you to renewed joy and deeper prayers for the lost. Sunday morning found us driving south through the rolling hills of Pembrokeshire farm country on our way to visit a church and meet some friends in Swansea. 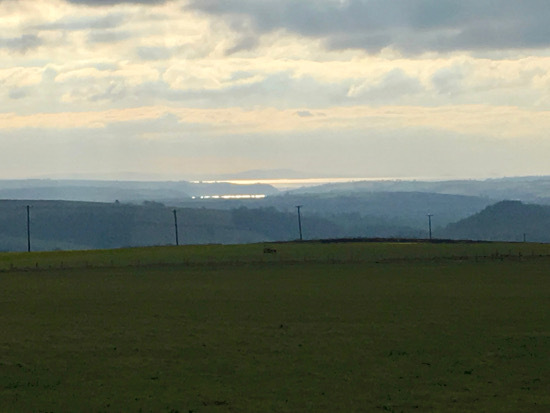 This view of Carmarthen Bay gleaming in the distant sunshine and the Gower Peninsula in the background obliged me to stop and try to capture it. We always find that the natural beauty that surrounds us becomes an inspiration for prayers of thankfulness to God for such an amazing creation. And at the same time, we experience a profound longing for the hearts of the people to awaken to the fact we have a loving Father—our Creator who sent Jesus to redeem mankind from our sinful, fallen condition. So our prayers become a curious mixture of admiration and sorrow. Oh, that men would turn to the Lord on his terms, confess their sins and embrace salvation! That they might discover one of our greatest human joys is worshipping God with a forgiven and thankful heart! And the parade of nations seems to continue here as well. 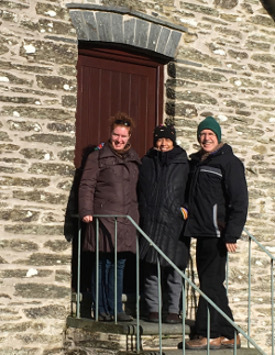 Last week we enjoyed a special blessing with the visit of two young ladies from mainland China and a dear friend from Singapore. These two are new Christians and it was our privilege to have them with us for a few days and share a few of our experiences and lives with them. 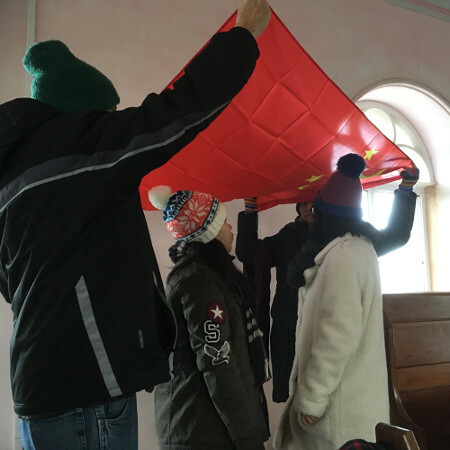 They also brought a flag of China which we have added to our collection, and it was wonderful to be able to pray for them and with them for their homeland. After praying for the flag as representing their country, we had them stand them under its covering and proclaimed the blood of Jesus bring salvation and true freedom for its people from the power of sin and death. There have been amazing moves of God in China over the years, and there is a huge underground church thriving. But that is accompanied by unrelenting persecution, and the vast majority are still unreached for the Gospel. Jesus said in Luke 21:33, "Heaven and earth will pass away, but My words will not pass away." Kings and kingdoms will all pass away, but God's Kingdom is everlasting. He has paid the price, made a way, and invites all to come in to Him from every tongue, tribe, and nation. One of the girls picked up this piece of slate on a walk nearby, and painted this figure on it and left it as a gift for us. 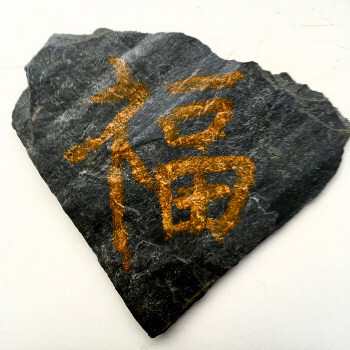 It is actually a very old Chinese character that means "blessing." It is made up of four parts. The tall symbol to the left means God, the top right horizontal line means one or heaven, below that the rounded square means mouth or man, and the bottom divided square means garden or field. So all together it shows God and man together in a field in a relationship, which equals blessing. Sadly, however, most Chinese people don't understand the real significance, it's just a blessing like some sort of good luck. But for us as Christians it becomes yet another reminder to pray for true blessing—that people would receive the revelation of God's Love for them and His offer of forgiveness and reconciliation for all eternity. This morning I was praying with a friend in the chapel and came across another important area of prayer for blessing in the story of Joseph. Genesis 39 tells how the Lord was with Joseph in Potiphar's house, and prospered all he did. He found favor with Potiphar and verse 6 says, "So he left everything he owned in Joseph’s charge; and with him there he did not concern himself with anything except the food which he ate." So we prayed for God's ministers around the world, that they would also find favor and not need to be concerned with things other than being directly involved God's work!